Return to “There is No Future Until We Get to It” by Dennis Báthory-Kitsz. Figure 10. 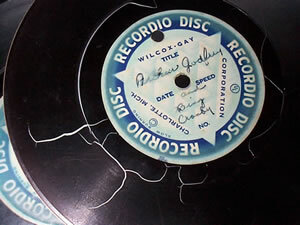 A paper 78 rpm record. The second hole kept it stable in the cutter. The plastic has shrunk, making it virtually unplayable, but the sections could be copied into digital form, pieced together, and the pops removed with hardly any loss. Figure 11. 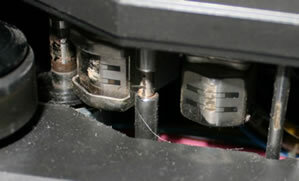 The inside of an 8-track cartridge shows that its endless-loop feature came from pulling the tape out from the middle, causing the platform to rotate and the entire pack of tape to slip against itself. Surprisingly, these tapes might jam but rarely wore out completely. Figure 12. The wreckage caused by gummy tape. 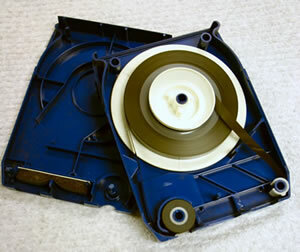 On the left is the capstan and pinch roller, covered in gunk from the tape oxide right after the tape started to hit. The white on the first head is mildew buildup. On the guide is a chunk of oxide sticking out to the left; the rest came off in a sticky blob onto the tape itself. The next head shows the gummy oxide buildup. The lifter on the right also has buildup. Flakes of mildew are everywhere. (The white line, though, is a cat hair.) The tape was cleaned and baked, and transferred completely. Figure 13. Archiving sometimes involves the original equipment. 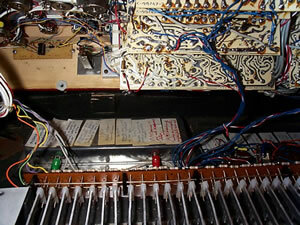 This is the Ionic “Performer” synthesizer with my changes described on labels stuck on the spring reverb case. Without the labels, repair would be nearly impossible. Figure 14. 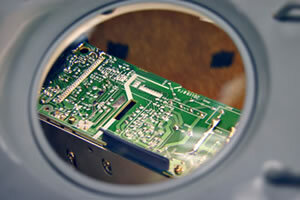 Looking under a magnifying lamp for stress fractures on a circuit board. A few were already found and repaired (jumper solder on the far right). Originally published in eContact! 10.x — Projet d’archivage Concordia (PAC) / Concordia Archival Project (CAP). Montréal: Communauté électroacoustique canadienne / Canadian Electroacoustic Community, March 2009.